A Median Auction Maiden Stakes over 5f on standard going. Quite a restricted race type for two-year-olds from an established sire with one or more yearling sales in 2013 of no more than £19,000. Nine juveniles are entered to run over this minimum trip on a turning course, which favours experienced horses. Five colts & one gelding take on the remaining fillies. A mix of top trainers take part in this Class 5 race. Johnny Sorerento is on a recovery mission after finishing last on debut in the Brocklesby. There was money for this colt and the stable were hopeful of a fair run. It wouldn't be beyond the realm to see a more professional performance today with that initial experience under his belt. Stan Moore won this race last year with Far Gaze, who was making his second start. The Moore The Merrier syndicate field Mount Isla racing in the same colours. This bay gelding, who is a son of Bushranger, cost just £6,000 when purchased by the trainer at the yearling sales. The twice French-raced dam showed little ability at three. Moore reported their juveniles have only just started working on the grass as it had been so wet and detailed that his three Brocklesby participants needed the race. His two-year-olds have a poor strike rate on debut and I would suspect this January foal will be better for the experience. The betting will be a good guide to the majority of the debutantes. Bill Turner needs no introduction with his two-year-olds of which he has a string of fifteen. The Sigwells handler has reported his juveniles to be backward this year although the string have progressed in the last two weeks. Paddy Again ran well when second in the Brocklesby. Connections should have a fair guide to their chances. Hell Of A Lord is a homebred colt owned by Mrs M Teversham. The mare, Miss Brookie, was similarly owned and trained - although a limited sprinter, she won at two. The sire was a talented two-year-old trained by Bryan Smart winning the Coventry Stakes (Group 2) and hit the frame in the Middle Park Stakes (Group 1). The stable usually have their juveniles fit and ready so drawn in stall one should be a positive. It is worth noting that for all Turner is credited as a trainer of first-time-out winners, his statistics do not give evidence to this point. He features about a 5% win rate with debutantes which does bring some concern. The fact that his horses run so well in the Brocklesby can be somewhat misleading to his next few runners which often prove lesser. A juvenile to respect but not for me if short in the betting. Rose Of Kiev hails from Mark Johnston's stable who can be tricky to assess on debut. As I have said many times 'his debutantes can be categorised as easy winners or poor losers'. This bay filly cost just 7,000 euros as a yearling. The sire was a class horse but wasn't a sprinter while the mare showed little ability in two starts. A horse I would rather watch than bet. Pickle Lilly Pearl is trained by David Griffiths, who certainly knows how to train a two-year-old winner. The stable is perhaps a little less fashionable that a few of these but someone I respect. Lilo Lil was a fair horse for them last year. This bay filly cost 13,000 euros at the yearling sales and bred to be a sprinter. 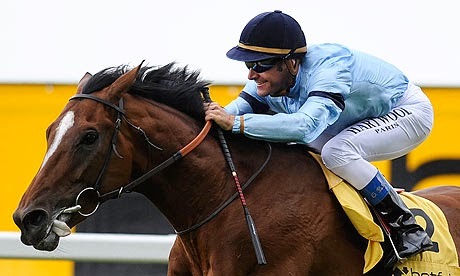 The mare won her first two starts over the minimum trip and then was placed at Group 2 level in Chantilly, France. Probably the type to take a watching brief but could be primed for a canny stable. Tom Dascombe is one of few trainers who can prime a two-year-old for a big debut performance. Richard Kingscote takes the ride on Don Sigfredo. This son of Majestic Missile is out of a Listed-placed mare and cost 29,000gns at the yearling sales. He is a half-brother to Andhesontherun, who won on debut for Roger Varian and wasn't disgraced in the Richmond Stakes (Group 2). A wide draw is never ideal for a juvenile on their racecourse bow, especially on a turning course. The betting is the best guide and if priced 7/1 & less has respectable win and place claims. The last of the fillies in the line-up is David Evans' Cheerio Sweetie. This stable are very much in the mould of Jack Berry with the approach of keeping their horses busy. This bay daughter of Captain Rio cost 20,000gns at the Tattersalls Yearling Sales. The stable don't feature a very good strike rate at the course although their two-year-olds have claims when priced 13/2 & less on debut. In general, their debutantes are difficult to assess and the types to either win well or falter. Money would be a good sign although I would rather take a watching brief. A trainer who can go well with his debutantes is Ralph Beckett. The stable often go well with their early runners and they have a decent strike rate at this course. Jim Crowley rides the all-weather tracks particularly well. Designate is a son of Approve and owned by Highclere Thoroughbred Racing Ltd. He cost 27,000gns at the yearling sales and half-brother to Bronze Angel. If fancied in the betting, has fair win and place claims but another who has to overcome a wide draw. Jet Mate cost 35,000gns purchased and trained by William Muir. This chestnut colt sired by Fast Company was born in January and half-brother to Sorella Bella (who finished 2nd in the Gran Criterium (Group 1) at San Siro, Italy). This family have achieved a good few winners. The owner, Martin Graham, has done well with his horses over the years (Blue Jack won on debut) and it wouldn't be the biggest surprise to see this juvenile progress with racing. The stable have a fair strike rate at this course and it is intriguing to see this colt out so early. On average, Muir's youngsters need the run unless talents. Conclusion: A tricky race to assess. Turning courses can be a rude awakening for two-year-olds on debut and those with a savvy will hold a fair advantage. A wide draw could be a concern unless swift of foot. Johnny Sorrento needs a transformation after showing little on debut but that experience will help today. Statistically Don Sigfredo & Designate are the most interesting. Don Sigfredo hails from a top-class stable who can go well on debut. If priced 7/1 & less I would consider this juvenile to have fair win and place claims. However, a wide draw is enough for me to take a watching brief. Designate is another to respect and perhaps on balance the most likely of these runners. Hell of A Lord & Cheerio Sweetie are difficult to assess. The stables can go well with their early two-year-olds and both have positives and negatives. Money would be a good sign but I would be tempted to take a watching brief. Rose Of Kiev looks to need further and Johnston just doesn't appeal to me as a bet on debut. Pickle Lilly Pearl is quite well bred and may show ability but not the type I would wager unless speculative odds. Jet Mate and Mount Isla may prove better on their second start. I'd have to take a watching brief.